These family-run resorts offer family clientele a combination of togetherness and/or solo time. There’s never a concern about nothing to do because there are so many choices. From reading a book to hiking, horseback riding, swimming and kayaking in the summer to sledding, cross country skiing, snowshoeing, ice skating and other nearby snow sports in the winter. 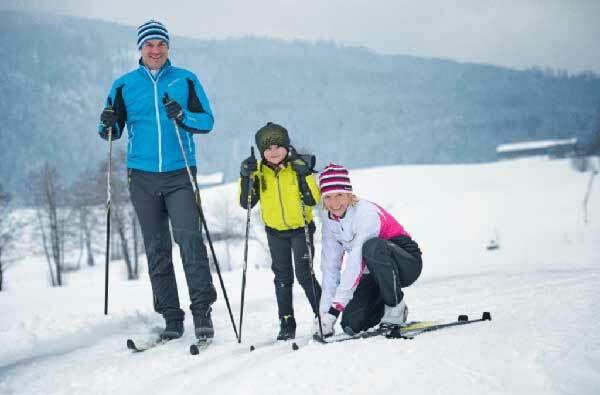 Many of these recreational activities are perfect for family bonding and they create joint memories to last a lifetime. Some folks like to simply unplug and enjoy being away from the hurried world of jobs, schedules, and commitments. Many families opt for their vacation time to become untethered from modern-day trappings such as smart phones and social media, for a heightened state of relaxation to enjoy a quieter, easier world. Anne Carter, owner of Carter’s Cross Country Ski Centers in Bethel and Oxford, ME has two daughters and sons-in-law that help with the operation of the two centers. “They’ve been playing at the ski areas since they were one and half years old and then helped out since they were in middle school with the operation in the shop, grooming, and giving lessons.” Of course, the kids’ friends were attracted to the ski areas and the customers got to watch the girls grow up and then see the grandkids around the centers. Jay Richards, the second generation manager of Maplelag Resort in Callaway, MN lives with his wife and kids at the resort, which continues to be the home of his parents so it’s truly a large family with three generations involved. Maplelag prepares plentiful, home cooked meals and family members gather in the dining area to mingle with other guests from other families. The family-style meals served at elongated tables are known to feed the camaraderie and family magic that can be had at the resort. Whether skiing or not, people rave about their time spent at Maplelag. The lodge is a treasury of Norwegian Folk Art with nooks and crannies to enjoy together or get away to relax and read a book. A Variety/Talent Show is organized each week and it’s a big hit for families whose performances feature everything from jugglers and family skits, to jokes, musical instruments and German beer drinking songs. The show is followed by the Saturday Night Dance, which offers an eclectic collection of music for dancers of all ages. The Richards pride themselves on making everyone who comes to Maplelag feel like they are part of the “Maplelag” family. They feel very connected to their guests and many have been coming for over 30 years. The bottomless cookie jar philosophy at Maplelag is a great example of how having access to cookies at any time at no charge creates a feeling of being “at grandma’s house” instead of feeling like the corporation is doing everything to maximize profits. Owner Jay Richards commented, “It is important that guests don’t ever experience feeling unwelcome at Maplelag. The word hospital stems from hospitality – and Maplelag is an operation that wants people to feel better physically, emotionally, and mentally after they have visited Maplelag. If the experience is enriching, then people will hopefully come back for more “Maplelag therapy”…and all of our families could use a little “fun” therapy.